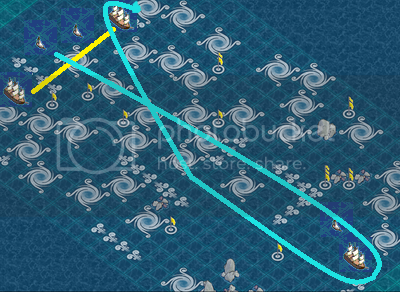 The Swarm?s Sloop Loop is a sloop race for teams of two pirates. The racers provide their own boat, are responsible for getting it to Paihia, and stocking it. The race will take place on Wednesday September 26th at 6pm game time, and will last a maximum of one blockade round. Teams consist of two pirates plus two bots. The race committee will check to make sure that there are only two pirates aboard the competing vessels. No green alts are allowed ? participating pirates must have at least 1 broad stat. Before the start of the event, move a sloop to Paihia Island and have it ready to go. Rum and cannonballs are available for sale at the Island. The race will be held inside a blockade board. Once the blockade starts, the committee boats will need to enter and set up the course. The Start Line is an imaginary line running between the two committee boats - Frigs - on the island side of the board. You must not cross the starting line before the starting Gun. The Frigates will fire a gun to start the race. Boats must cross the start line island side toward ocean side after the gun sounds. Boats that have crossed prior the guns are not eligible to race until they crossed the line properly. Failure to start properly will result in disqualification. After starting the race, participants may not leave the board (enter the safe zone). Boats that are bumped off the board may re-enter as long as they re-enter the board no closer to the next buoy. Boats that leave the board must serve a 2-turn penalty and must re-enter no closer to the next buoy. Boats that fail to serve the penalty or re-enter closer to the next buoy will be disqualified. In addition to the two race committee start boats at the start finish line, there will also be an ocean side Buoy (frigate). The course involves rounding this buoy, coming back between the starting frigates and "Looping." The race consists of two laps around the marks. Cannons will be ineffective, but you may ram, cut off, or bump the other boats. Remember this strategy when placing your move tokens. Click here to see Bailet's sample race video. The first team to complete 2 laps and cross the finish line is the winner. Interested teams can sign up by replying to this thread. Hey i just wanted to know if you could change the timing by 30mins to 6:3pm gt? I know this is a bit lot to ask for a single participant but thing is i return home at 6pm gt i'll require 30mins to just freshen up have a bite etc. Wow, my innocent eyes didn't see that the first time around. The people in Team Bacon Strips have keen eyes. Prizes have been updated to make the win even sweeter! Hope to see you there. The boat names are 1) Victorious Sailfish - painted Black/white and 2) Triumphant Sailfish - painted White/black. This event will be taking place in 2 days!! Come play with the Swarm!